Looking for a little more room to spread out? 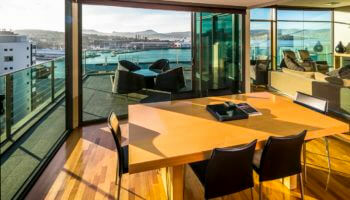 The Harbour View King’s spacious suite (42sqm) with views over Hobart’s magnificent harbour and waterfront of Sullivan’s Cove may just be what you may need. This harbour view king suite is just a short walk from historic Salamanca Place and Battery Point. Enjoy the comings and goings of the many sea vessels including ferries, commercial ships, Antarctic ice breakers and some of the largest cruise ships in the world, all in comfort and style. 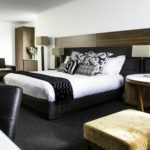 Lenna of Hobart understands what luxury and comfort mean. 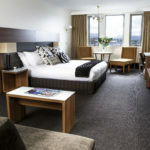 Our rooms include amenities that truly make them a room that our guests can enjoy staying in after a long day out in Hobart. 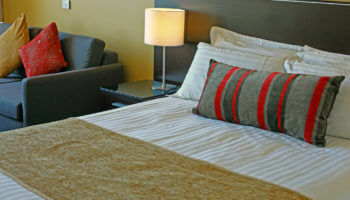 This suite features a king-sized bed and maximum occupancy 3 guests (additional charges apply for 3rd person).